What do you - want to do ? An original and convivial après-ski activity in Les Arcs! 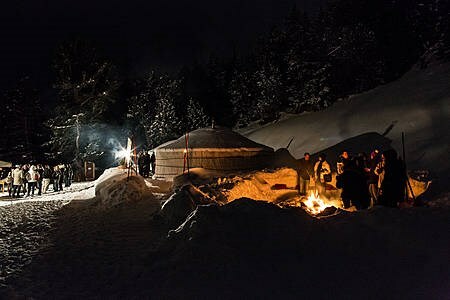 Enjoy a unique evening just next to Arc 1950, visiting the famous Les Arcs Yurt. You can get there on snowshoes or along a torch lit footpath. Come and relax in a setting that is both unexpected and original. An evening by the fireside in these real Mongol yurts is like travelling to a different land. Whether you come on your own, or with friends or family our Yourtine will be delighted to welcome you.